In October 2015, IOM launched its Early Warning Information Sharing Network to commence sharing data between IOM, government agencies, and other humanitarian actors in affected countries of arrival and transit. 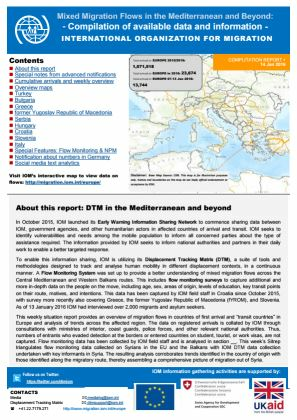 Further, a Displacement Tracking Matrix (DTM) Flow Monitoring System was set up to provide a better understanding of mixed migration flows across the Central Mediterranean and Western Balkans routes. The Flow Monitoring System includes this weekly flows compilation, providing an overview of migration flows in countries of first arrival and “transit countries” in Europe, and analysis of trends across the affected region. There was an increase of 36% in total arrivals to countries of first arrival (Greece, Italy, Malta, Spain, Bulgaria) for the period of 07/01/2016 - 13/01/2016, compared to the week before.